We do not curently have theatre tickets available for The Gruffalo. This could be because we have simply sold out or it could be that this show is no longer running. The information on this page remains purely for historical and informational purposes. Searching for hazelnuts, Mouse meets the cunning Fox, the eccentric old Owl and the high-spirited Snake. Will the story of the terrifying Gruffalo save Mouse from ending up as dinner for these hungry woodland creatures? 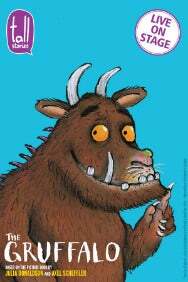 After all, there’s no such thing as a Gruffalo  is there?